A search engine is “a program that searches for and identifies items in a database that correspond to keywords or characters specified by the user, used especially for finding particular sites on the World Wide Web.” Google is most widely used search engine in Asia-Pacific and all over the world. Google has the largest market share of nearly 85%, based on the number of times a search engine is used on a platform and their major revenue is generated from advertising. As search engines are now a part of daily lives there are increases number of searches related to almost anything in the world. In 2017, 1.90 billion people in Asia-Pacific had access to internet, and mobile phones accounted for 54.7% penetration in 2017, which accounted for the highest website traffic. Thus the rising penetration of mobile devices and internet is driving the growth of Asia-Pacific search engine market. Over the years of using Google as the major search engine, it is now used as a verb i.e. ‘to Google’ means ‘to search’. China has developed its own search engine ‘Baidu’, which has huge popularity among the Chinese people. The world’s largest population is in China and almost 95% users search through Baidu, thus earning huge revenues. Further, the search engines are facing the challenges of acquisitions of being biased and they change the data as per interest of the companies. Thus, there is rising opportunity for developing new search engines such as Toronto based ‘Million Short’ that displays wider search choices to the users and also cut shorts the top sites in order to display good content sites that might have poor SEO or small marketing budget. Goldstein Research analyst forecast that the Asia-Pacific search engine market is set to reach nearly USD 100 billion by 2024, growing at a CAGR of 4.3% over the forecast period (2017-2025). Mobile phones platform accounted for largest market share nearly 81.6% in 2017, followed by tablets and desktop. Mobile phones are most used device among the other platforms hence acquired largest share. Based on geography, China accounted for largest revenue share of 59.6% due to huge population and penetration of internet. China is followed by India, Japan, South Korea and Indonesia. The report covers the present ground scenario and the future growth prospects of the search engine market for 2017-2025 along with the market players’ analysis. We calculated the market size and revenue share on the basis of revenue generated from major players in the Asia-Pacific region. Asia-Pacific Search Engine Market Outlook 2017-2025, has been prepared based on an in-depth market analysis from industry experts. 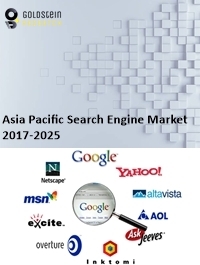 The report covers the competitive landscape and current position of major players in the Asia-Pacific search engine market space. The report also includes porter’s five force model, SWOT analysis, company profiling, business strategies of market players and their business models. “Asia-Pacific Search Engine Market Report” also recognizes value chain analysis to understand the cost differentiation, pricing models to provide competitive advantage to the existing and new entry players. Our Asia-Pacific search engine market report comprises of the following companies as the key players: Google, Bing, Yahoo, Baidu, Shenma,YANDEX RU, etc.